Beets- some people hate them and some people love them. I'm a lover, and I was excited to come across this product in the refrigerated cases by the butcher in my Costco. 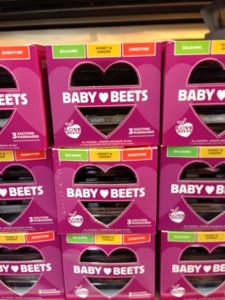 Each pack contains three different varieties of flavored beets - balsamic, honey and ginger, and sweetfire. All taste similar to the pickled beets my Pennsylvania Dutch grandmother used to make, with sweetfire being the most flavorful. I think beet lovers will like these; I anticipate using them cold in salads and probably using one pack to make Pennsylvania Dutch pickled eggs. Beet haters are still gonna hate.